many users will raise the most concerned question when they buy solar streetlight controllers, how long is the service life of solar controllers? Now for you to analyze the solar lamp controller service life, by what aspects of the impact. components of the solar street light controller are one of the important factors determining the service life of the solar energy controller. In order to save the economic cost, some manufacturers use some components whose precision is not enough and the resistance value is relatively poor. At the beginning of the test, the installation was no problem and could work normally, but the operation was less than one month and half a year more. The performance of the components failed, and the controller either did not have high and low voltage protection or could not detect the voltage normally. Causes the street lamp to not work normally, the serious damage battery. Solar streetlight controllers are generally installed outside for 365 days without interruption, and the use environment is very harsh, if not fully waterproofing, or installed in a waterproof box, For a long time, it is easy to cause internal electronic components short circuit. 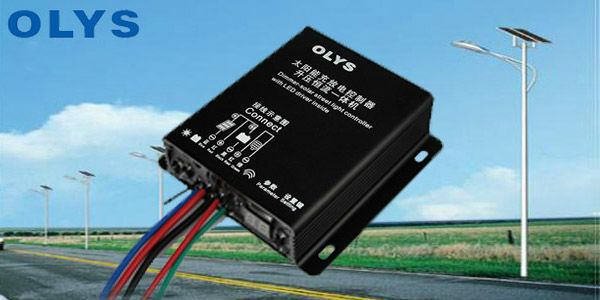 OLYS Solar Controller uses full glue filling technology, waterproof grade IP68. Be able to adapt to any bad working environment. some small factory uses the manual plug-in, it is easy to cause the error, some capacitance inserts the wrong, some resistance inserts the reverse. It affects the service life of the solar lamp controller. OLYS uses SMD, machine operation, reduce man-made bad. Source: SHENZHEN OLYS COMPANY LIMITED,http://www.olyssolar.com.